This entry was posted on November 29, 2017 at 6:24 pm and is filed under 1980s, Heavy Metal, Heavy Metal and the 1980s, Music, Rock, Uncategorized with tags Americans, Bryan Adams, Cat Scratch Fever, Classic Rock, Guitarists, hard rock, Heavy Metal, Heavy Rock, Journey, Penetrator, Savatage, Scream Dream, Ted Nugent, The 1980s, Weekend Warriors. You can follow any responses to this entry through the RSS 2.0 feed. You can leave a response, or trackback from your own site. I’m unfamiliar with this album but I like a lot of Ted’s albums so I should check it out at some point. I know of the late, great Bobby Chouinard from his work with Billy Squier in the ’80s. He was a very talented player. He definitely was. “Penetrator” is one of his lesser known albums but I like it. I dont really know him particularly but I remember his episode of MTV cribs was fabulous! I heard he has a nice pad, I’ll have to watch that. I’ll be visiting a Squier album in the not too distant future. I’m going to have to keep an eye out for the crossover. I never heard that one as I was in the UK by then and Billy is the best American artist not to have cracked the UK. So, I’ll be looking forward to listening to it as well. Hear and Now is a solid piece of well written rock….I’ve propped up that album more than a few times on my blog and on social media! 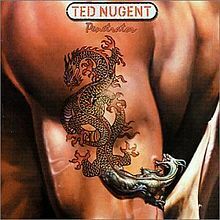 Ted Nugent has some great hidden gems! Oh he does indeed! Thanks for stopping by.